The Hindu rights group says it will conduct a citizen’s arrest of the Perak and Ipoh police chiefs if they fail to act against policemen who it claims are guilty of assault. PETALING JAYA: Hindraf Makkal Sakthi has threatened to carry out a citizen’s arrest of the Perak and Ipoh police chiefs if they refuse to detain the policemen who allegedly assaulted its national secretary, P Ramesh, yesterday. Ramesh said in a press statement today that Perak police chief Mohd Shukri Dahlan and Ipoh OCPD Azisman Abdullah would be abetting in a crime if they failed to take action on the alleged assault during a street demonstration outside the state assembly building in Ipoh. “If they do not act on this, then Hindraf will arrest Shukri and Azisman instead under Section 27 of the Criminal Procedure Code, which allows for citizen’s arrests,” he said. 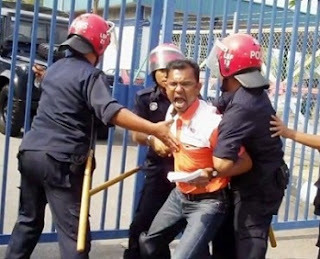 Yesterday, Ipoh police arrested 14 people, including Sungai Siput MP Dr Michael Jeyakumar, during a peaceful demonstration outside the state assembly building in Ipoh. The protesters had gathered there to highlight the plight of Kampung Dewan Bandaraya Ipoh villagers, who have been waiting for more than 10 years for their land titles. In the meelee, Ramesh said, several policemen assaulted him. He vomited and could not stand on his legs, he added (see photo). He was rushed to the Ipoh general hospital. Ramesh also claimed that the hospital’s personnel, under instruction from the police, did not give him proper medical attention. “The hospital did a CT scan on me only after my wife insisted on it,” he said. Ramesh also demanded that the hospital give him a medical report within 24 hours so that he could get a second opinion on his condition. He alleged that the hospital yesterday refused to furnish him with it. “If they fail to heed my request, I shall assume that the hospital is colluding with the police to cover up the assault I suffered,” he said. Washington, D.C. (April 12, 2011) - The exiled Malaysian human rights lawyer and founder of the Hindu Rights Action Force (HINDRAF), Waytha Moorthy, completed a seven city tour of the United States sponsored by the Hindu American Foundation (HAF) last weekend. Moorthy was jailed and then exiled from his native Malaysia, and HINDRAF was banned after organizing a peaceful rally of more than 50,000 in 2007, protesting the country’s persecution of ethnic Indians and Hindus. Moorthy’s speaking tour took him to several meetings on Capitol Hill in Washington, D.C., as well as stops on university campuses and community events. He called for international attention to be focused not only on the mass movement of Hindus and other religious minorities that was crushed by the Malaysian government in 2007, but also on the ongoing systematic discrimination. Hindus, who were brought to Malaysia from India as indentured laborers by the British during the 1800’s, comprise between six and seven percent of that country’s population. Many human rights organizations assert that Malaysian Hindus are economically deprived and lag far behind ethnic Malaysian Muslims who benefit from a majoritarian affirmative-action policy that includes discounts on housing, quotas in educational institutions, and preference for government jobs. Moorthy’s lectures detailed attacks on temples and religious shrines and several high-profile legal battles where Hindus have been forced to deal with the Sharia law courts in personal and family matters. 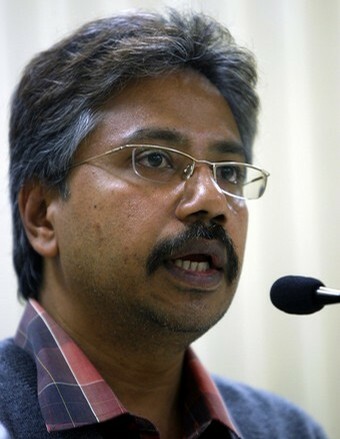 Moorthy sought political asylum in the United Kingdom after Malaysia revoked his passport in early 2008, and he remains the voice of HINDRAF after most of its founding members were jailed in Kuala Lampur. HAF joined Moorthy in December 2008, when the Foundation spoke at a briefing on Malaysia at the House of Lords. This most recent speaking tour is the latest of HAF’s ongoing efforts to focus attention on Malaysia -- a country otherwise commonly held up as a model Muslim democracy. While in DC, over three days, Moorthy, accompanied by HAF’s Associate Director, Jay Kansara, held meetings with twenty-one House and Senate offices, key subcommittees, and the Tom Lantos Commission on Human Rights. They also met with fellows and staffers at the American Enterprise Institute and the United States Commission on International Religious Freedom (USCIRF). Throughout his trip, Moorthy showed footage of media coverage of the historic HINDRAF rally and the subsequent violent response by the Malaysian authorities, and he also described daily acts of discrimination faced by religious minorities in Malaysia. Kansara and Moorthy urged congressional leaders to hold a congressional briefing on the issue and persuade the Malaysian government to meet with HINDRAF leaders and address alleged rights abuses in that nation. Injuries to P. Ramesh by brutal Polis Raja Di Malay-sia. 14 days Notice by P.Ramesh to register Hindraf Makkal Sakthi served on PM Najib, Home Minister, ROS Putrajaya and ROS K.L. Immediately after 26/4/11 we will file the High Court Civil Suit seeking the legal registration of Hindraf Makkal Sakthi. And do expect a “bomb shell” on UMNO. 10.00 P.M News Flash : 40 Hindraf & HRP supporters @ P.Ramesh’s candle light vigil @ Ipoh General Hospital. Bt there are 15 Police patrol cars with their flash lights & intermitten siren on. Tere are also 40-50 police men watching. The press Conference was led by Subramaniam, Vice President HRP Perak.